“We are four felines, Nyxie, Nala, Calico and Saintlee who were confined to the house and yes, two of us used to fight a lot. 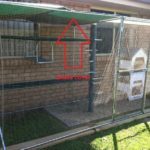 Our Human Mum got CATMAX to erect a lovely enclosure for us to safely roam free from the house and do what cats love to do. We just love going outside and lazing in the sun, climbing up high, feeling the wind in our whiskers, smelling outside smells, peeking over the fence at our neighbours birds, playing in the garden and playing with the odd bug or lizard that dares to venture in our space. We also love going out at night time when we like to think were hunting, although we don’t catch too much, oh and that stuff they call rain is quite funny too don’t know that we like that though”. 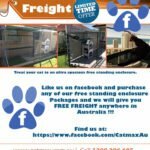 “So thanks to CATMAX who allowed us to venture outside and do what cats love to do, and by the way we don’t fight anymore, except when Nala decides to sit in the cat door and not let any of us out”.